What do you think about the new Tumblr widget? 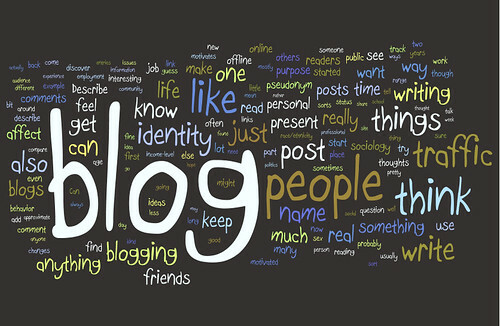 Are you going to start your blog? We’d love to know. Please leave a comment right here on our blog and tell us all about it. I would like more clarification. 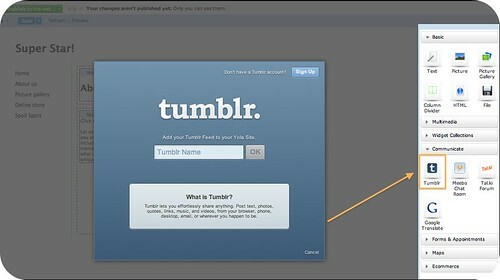 Do we use the Yola Blog widget or do we go directly to tumblr to start our blog? I don’t see a tumblr widget on my site. Thanks. If you look at the screenshot in the post you’ll see the toolbar on the right where all the widgets are, click the arrow next to “Communicate” to expand that list and that’s where you’ll see the Tumblr widget. Drag it onto your site and either connect to an existing Tumblr blog account or click the link in the upper right hand corner to “Sign up”! As a trainer I could use any help in marketing services. I want to reach out to as many local potential clients as possible. I know nothing about blogs or using facebook to sell my services. How do I link my blog up for FB and twitter? Hi Michele, are you referring to the Tumblr blog or a Yola blog? For Tumblr, you should contact them for support. For a Yola blog, please check out this forum post. I am confused, I don’t see the widget anymore. Did you guys remove it? I currently have a yola blog on my yola site. How would I go about transferring? Can I move all of my previous posts over or do I have to start from scratch? Hi Nancy, your content can’t be transferred unless you did it manually. Some people will leave their old blog live and then pick up where they left off on a new platform.